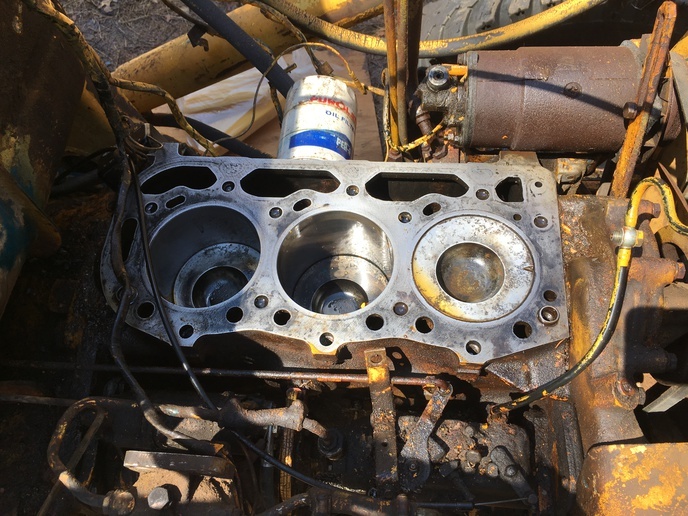 Should the piston be flush with the top of the block at top dead center? See picture, cylinder number 3. Engine is frozen, not sure why. With the engine frozen, there is no way to know if the piston is actually at top dead center. If you can get the engine to turn, then you could turn each piston to the top and compare the heights, or check the engine specs to see what the proper piston to deck clearance should be. All that is not important though, if it is seized, it will need to come apart and find out why. Thanks. I looked up the specs, it indicates that the piston crown to block face clearance is .014”, so it looks like this one is not out of the ordinary. There was a lot of carbon deposits on the other cylinder walls down to about 1/2 inch from the top so I thought maybe that was an indication of the max piston travel. Apparently not, though that still begs the question as to why those deposits were there. I am soaking the cylinders with penetrating oil, so hoping to free them up. If not will have to remove the oil pan, oil pump, and piston rods. The oil pan removal looks to be a challenge on the 4500 industrial since it has four large frame bolts in addition to the regular pan bolts. Any history on the engine? Was it running and stored long term, now stuck? Doesn't appear to have had water in the cylinders or rusty. Was it running and lost power, locked up? If so, something is likely wrong in the bottom end. Run hot? Out of oil or no oil pressure? Have you eliminated the possibility of some accessory, like a hydraulic pump, could be locking the engine? That 1/2" of carbon deposits is where the top ring comes to at the top of its travel, the top ring is located about 1/2" down from the top of the piston. Thanks. The tractor has been sitting unused for around 14 years. No known issues when it was parked. When I took off the head I found it had water and rust on the crown of the front-most piston (Number 1). But that piston is nearly at TDC, so cannot see the cylinder walls. Number 3 had some rust on the cylinder wall, which I sanded off, going from 120 to 400 grit. Some pitting remains, but not currently a show stopper. Number 2 was mostly ok, one very small area of light rust on the cylinder wall. I cleaned that up also. I drained the oil, found about a quart of water in the oil. I removed the alternator, but not yet the hydraulic pump. I will try that next. Is it possible that the torque converter is frozen? I looked in the small panel underneath the transmission but could not see any obvious issues there. After removing the hydraulic pump if it is still locked I may jack up the back end and see if the wheels spin. the culprit. Also, is it possible the torque converter could be frozen? Correction, the piston at the top of its stroke in the picture is in the number 1 cylinder, not number 3. I had it backwards. That makes more sense, it probably is just rust stuck rather than seized. One thing to look for, if there is some accessory holding it, there will always be "some" movement of the engine, some mechanical slack. A stuck or seized engine generally will not budge in either direction. You will be money ahead to go ahead and remove the pistons. Even if you can get it to break loose, the pistons will need to come out and the ring lands cleaned of rust and everything inspected and checked. I would start soaking them with penetrating oil while you get the pan off. Once the pan is off, try to get #3 out, then #2. Save the worst for last. With the rod disconnected from the crank (if possible), and the crank protected, make a carefully fitted wood block to hammer down on the stuck piston. You want the block to cover the entire surface of the piston to distribute the load of the hammer. If #1 is the stuck one, you don't want to be hammering it(or any for that matter) with the rod still connected, as it is near TDC and will transfer too much shock load to the crank. Trying to force the crank to turn in that position will transfer extreme pressure to the piston, which will be to your advantage, but the object is not to damage anything. Good luck, be careful! Diesels are unforgiving beasts when it comes to shortcuts. They will find any weakness and attack viciously through the pocket book! Great feedback, thanks. There is no motion whatsoever in the pistons, and I just checked the hydraulic pump, which does have some mechanical slack at the drive shaft, so it seems likely that the number 1 piston at a minimum being rust stuck is probably the culprit. I have been doing some research on how to take out the oil pan, it is a challenge on this engine because it seems like it requires splitting the tractor between the engine and the front-end, and then moving the whole front end forward 3-4 inches to be able to access some of the pan bolts and drop the pan. The pan itself is cast iron and weighs 90 lbs. The service manual I have only shows the sheet metal pan, which I guess is used in the 4000, not the 4500, so no clear step by step instructions available. The tractor is still in the field where it has been sitting for many years, so I was trying to avoid splitting it there. But will start prepping for that option if the penetrating oil does not loosen things up in the next week or so. was stopping against a stuck lifter. Soak it and try to move the crankshaft in both directions after a couple days. below may have some helpful hints.